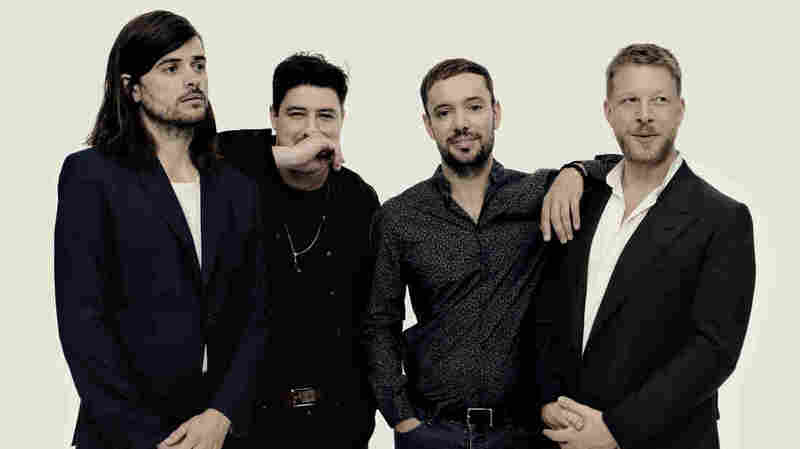 Mumford & Sons Get Acoustic Again On World Cafe : World Cafe The members of Mumford & Sons went through a lot of personal changes that fed into writing the band's fourth album, Delta. Since the band's early days as an entirely acoustic outfit, Mumford & Sons' built its sonic empire on fostering intimacy and immediacy. Now that the group is performing production-heavy shows that require venues big enough to accommodate a ground-breaking stage plot, that's a bit more challenging to achieve. But it's very possible and it's very important to the band, as I learned in my conversation with members Marcus Mumford and Ben Lovett. We spoke about some of the personal changes that fed into writing Mumford & Sons' fourth album, Delta. Ben went through a divorce, Marcus became a father of two. They revealed the surprising film they had playing on silent in studio while mixing the single "Guiding Light." Marcus also shared the story of a life-changing conversation he had in Mosul, Iraq with the father of a child who had been severely traumatized by living in conflict, how that experience inspired the title track to Delta and how Marcus' passion for humanitarian work has informed the rest of his life. Hear our conversation and a stripped-down, acoustic performance in the player.